Rent Neptune Studio Small Event Space | Corporate Events | Wedding Locations, Event Spaces and Party Venues. 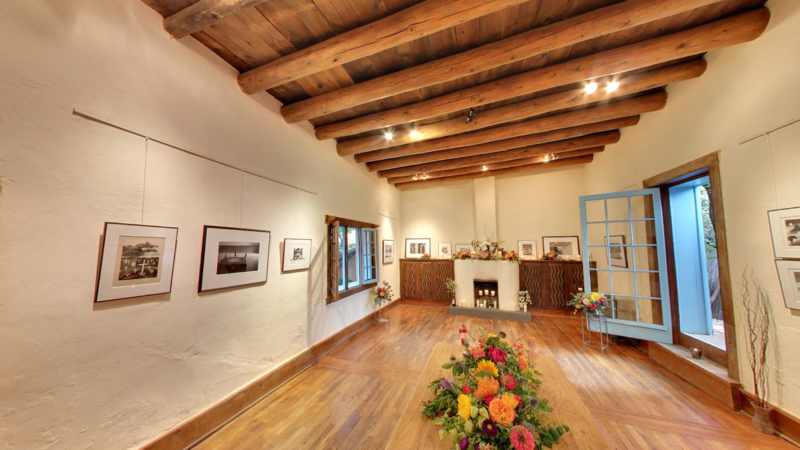 Canyon Road's most charming and private, small event space in a historic adobe gem and working art studio. For an absolutely unique, and memorable wedding, we are Canyon Road's hidden gem; a charming, private, small event space in a historic adobe home and working art studio. Authentic, bohemian, and shabby-chic elegant; 700 square feet of indoor space plus private gardens with shaded flagstone patios, a gazebo, and seven apricot trees left from the historic orchards on Canyon Road. Dating back to the 1830s, we have twelve foot tall, beamed cielings, wood floors and great acoustics. This is the real deal! When you book our space the entire grounds are yours. Perfect for intimate events, small weddings, rehearsal dinners, showers, cocktail parties, creative workshops, dinners and much more. Bring your imagination and your dreams; we will work with you to make it happen!